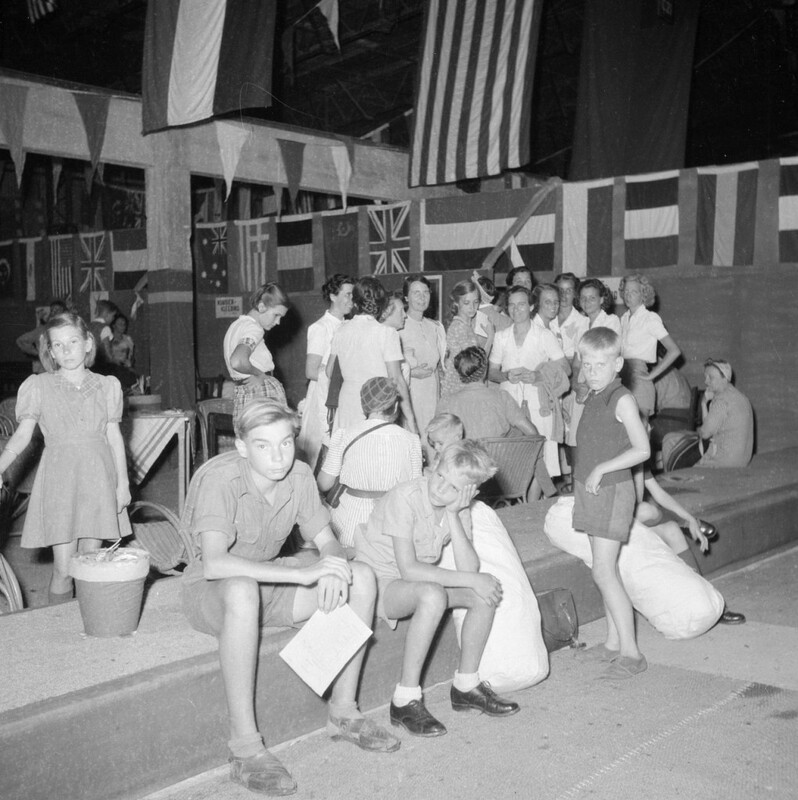 With assistance from the English Army and American Relief Organizations, the Dutch Government had established a transition point in a WWII supply depot of the English and American Armies on a stretch of desert on the east coast of Egypt just south of the entrance to the Suez Canal. 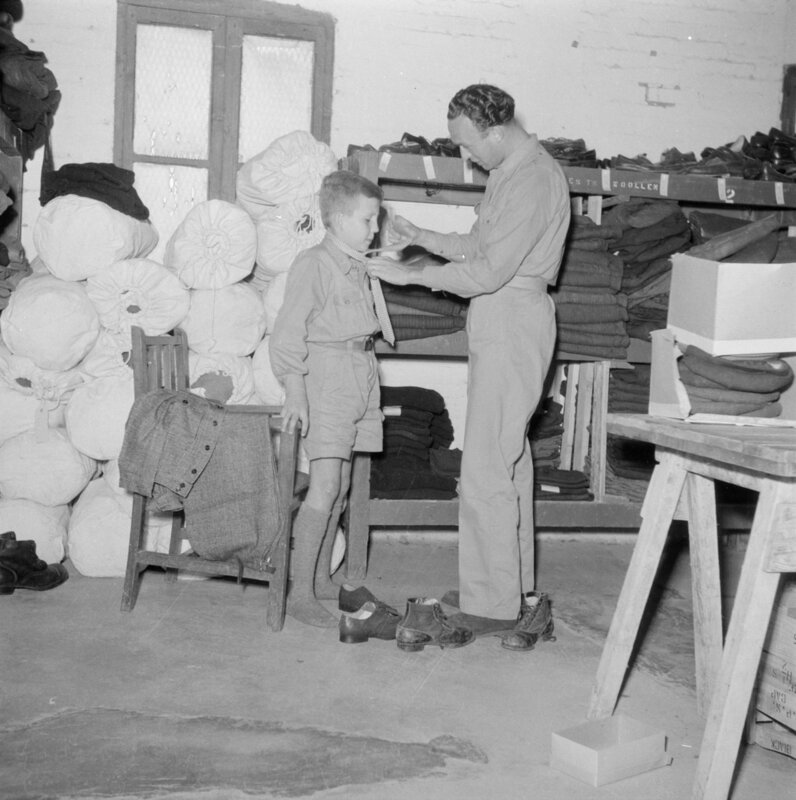 The purpose was to provide prisoners of war that were being repatriated to The Netherlands with warm clothing, ration coupons, documentation, and other assistance. 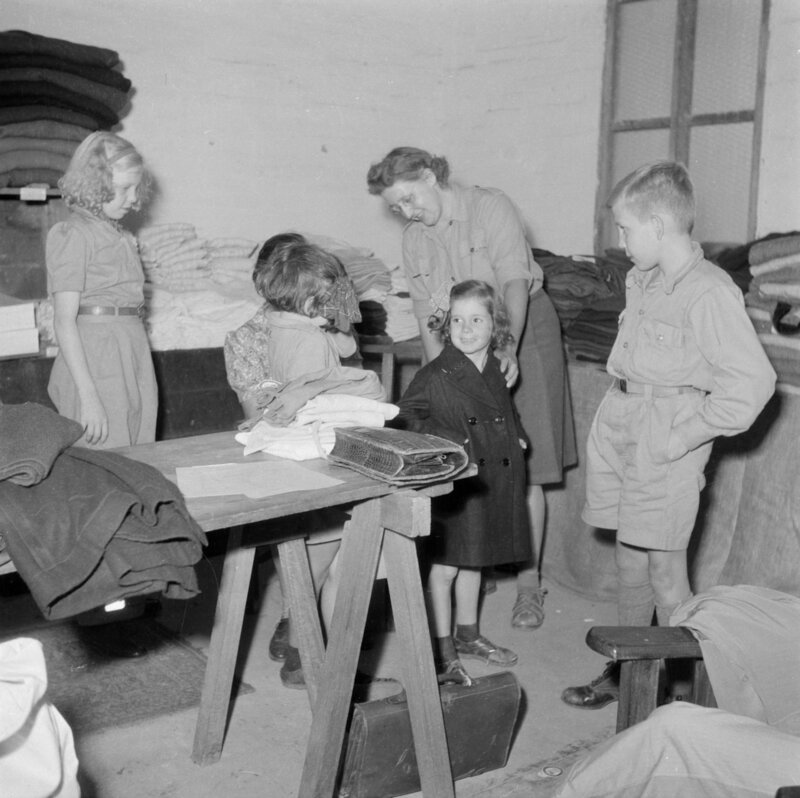 We were put ashore in Ataka (Ataqa), a harbor south of Suez, in groups of 100 to 200 at a time and rode a small-gauge freight train a short distance through the dessert to the supply depot, where we were welcomed and coddled by English military personnel, German military prisoners-of-war from the Africa campaign, local Egyptians in long white robes, Dutch military and trained Dutch female volunteers. It felt like Christmas, Easter and Birthday rolled into one. There were flags and decorations hanging from the rafters, all sorts of food and drink, cookies and candies, and a band dressed in white jackets playing cheerful music. But most exciting of all, there were racks and shelves of clothes waiting for us. After a civilized cup of tea with cake, the four of us fanned out to our respective sections to be outfitted with a full set of clothes. I could not pass up a pair of mountain climbing boots of leather and sail cloth matched with knee-high heavy wool socks. The boots were not new but they felt like doeskin gloves on my feet, surprising considering I went barefoot much of the time that we were in Singapore. Next I claimed a pair of brown velveteen imitation lederhosen and topped it with a dark brown lambskin bomber jacket. The jacket was not completely new either but it was one-of-a-kind and just looking at the curly wool on the inside made you feel cozy warm. The man who helped me then found a fine wool cap with a matching wool scarf and a pair of dark mittens. I must have looked at the mittens as if they had blown in from outer space because he assured me twice that they would be worth a kingdom to me coming winter. And he turned out to be right. The mittens, the bomber jacket and my boots eased me through the long cold winter of 1946 as I stubbornly wore my velveteen shorts. It turned out that indeed not all of the clothes were new. 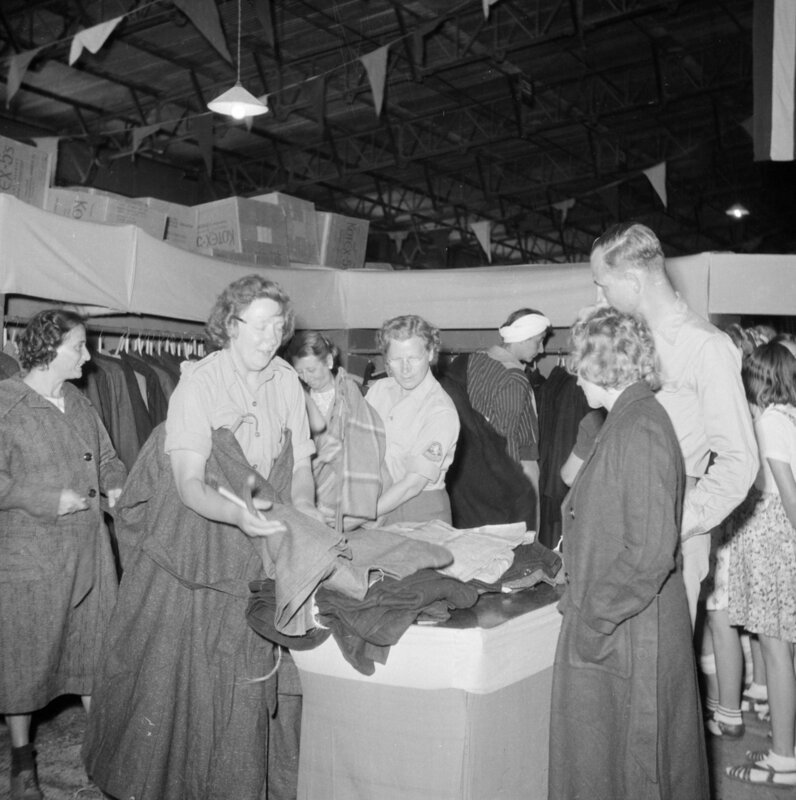 The men’s suits and shoes and most of the overcoats were, but the types of things that I selected were near-new items donated by families in Amerika (United States). I must have looked like an idiot, top heavy in wool above the waist and ready for a spring stroll in Tirol below, but I was delighted with my ensemble. I stuffed all of it plus a couple of warm shirts and other small things – but no ties, thank you – in the white pillowcase duffel bag that they had issued me when I started and went to see how the rest of the family was faring. Mams also had made a lucky acquisition. She found a used full-length black sable coat that was the most stunning coat that I had ever seen. The Dutch lady who helped her find it was so pleased that she made Mams show it off to the other ladies. Mams wore the coat as it was for a couple of winters and, when she could better afford it, had the blemished sections removed and the remainder fashioned into a short fur coat that she wore proudly for many years. Paps sported a classy grey suit with all the furnishings and looked ready to go to work then and there. I had not seen him wear a cap before but he looked dapper and knew it judging from his peevish grin. Adri went the route of what I thought of as formal boy scout, sparked up with a couple of nice ties. When he tried on a black wool overcoat, he looked like a Boy Scout leader. After some more refreshments in the Cantina, Adri and I loaded our four duffel bags on our shoulders and we rode the train back to the Nieuw Amsterdam. This had been a most excellent day.